Best ice fishing we’ve ever had! Our recent trip to Pasha Lake was the best ice fishing we’ve ever had! Day one, Chad took Brian Hanke to a secret trout lake. After a 20 minute snowmobile ride, they arrived, drilled some holes and within 2 minutes Brian landed the first of many splake. After two hours of fishing, both had a limit of splake and brook trout. They brought them back and Michelle made them an unforgettable splake meal on the grill!!!!!!! Day two, Josh Hanke and I arrived, and we all went back to the secret lake. Once again, we limited out on splake in just a couple hours. Brian also caught his first rainbow trout through the ice. What a beautiful fish it was!!!!! Chad then mentioned a walleye lake only an hour away. So we packed up the sleds, and off to catch some “eyes”. After a scenic snowmobile ride through the Canadian bush, we set up our rods and built a fire on the ice. I was having a had a bit of trouble with the fire, so Brian, being the Boy Scout that he isn’t, helped me out to get it going. The bite was a bit slow at first, but towards evening, holy cow!!! Josh landed a 23.5 inch walleye and we landed 3 other walleyes over 20 inches. When it was all said and done, another limit of fish on the same day. 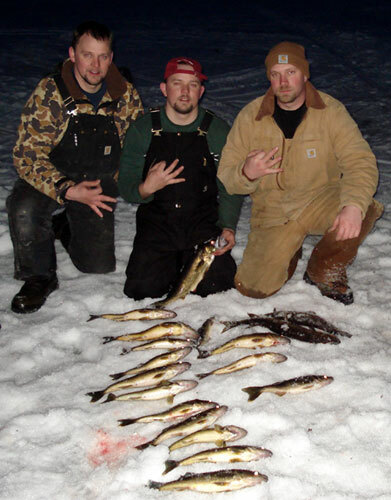 We agreed that it was by far the best ice fishing we have ever experienced. And being from Minnesota, that is saying a lot. Josh, Brian and I would like to thank Chad for the great Canadian fishing experience, and Michelle for the AWESOME fish dinners. We will surely be back for more!